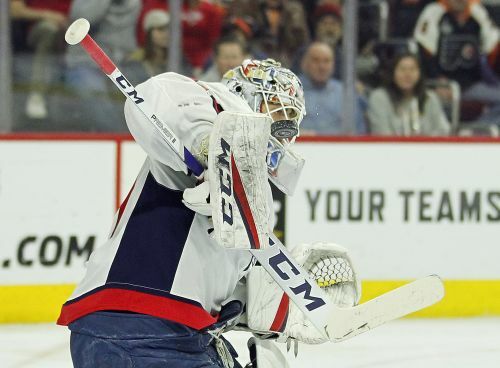 PHILADELPHIA (AP) — Alex Ovechkin and Nicklas Backstrom each had a goal and an assist, and Braden Holtby got his 250th career win as the Washington Capitals beat the Philadelphia Flyers 5-3 Wednesday night to reclaim sole possession of first place in the Metropolitan Division. Brett Connolly, Tom Wilson and Andre Burakovsky also scored for the Capitals, who won their fifth straight and seventh in the last eight. Washington began the night tied with the Islanders atop the division. Ovechkin moved one point from reaching 1,200 for his career. He will become the third active player and 49th all-time to reach the mark. Claude Giroux had a goal and an assist, and Scott Laughton and Philippe Myers also scored for the Flyers, whose rally from a 5-0 deficit fell short. Philadelphia had won 16 of 21 to close within reach of a postseason spot after sinking to the NHL's worst record in January. The Flyers remained seven points out of the second wild card in the Eastern Conference. VANCOUVER, British Columbia (AP) — Alex Edler scored 3:11 into overtime as Vancouver rallied past Toronto. Loui Eriksson and Josh Leivo also scored for the Canucks, who trailed 2-0 after two periods and snapped a three-game skid. Adam Gaudette had two assists and Jacob Markstrom stopped 28 shots. Morgan Rielly and Ron Hainsey had goals for the Maple Leafs, who lost when leading after two periods for the first time this season. Frederik Anderston finished with 29 saves. ANAHEIM, Calif. (AP) — Robert Thomas and Alex Pietrangelo scored 12 seconds apart late in the third period, and St. Louis rallied to beat Anaheim. Thomas got his second goal of the game with 1:04 left on the rebound of a loose shot and Pietrangelo rifled a shot through traffic for the game-winner with 52 seconds remaining for his 12th goal of the season. Pietrangelo, Brayden Schenn and Ryan O'Reilly each had a goal and an assist for St. Louis, which has won 14 of its last 18 games. Vladimir Tarasenko and Colton Parayko each had two assists and Jordan Binnington stopped 23 shots. Jaycob Megna had a goal and an assist for Anaheim while Nick Ritchie, Rickard Rakell and Adam Henrique also scored. Rookie Troy Terry had three assists and John Gibson made 28 saves. LAS VEGAS (AP) — Deryk Engelland scored his second goal of the season in the third period to lift Vegas. Shea Theodore also scored for the Golden Knights and Marc-Andre Fleury stopped 33 shots for his league-leading 33rd win of the season. Vegas pulled seven points behind second-place San Jose in the Pacific Division and 10 behind first-place Calgary. The Golden Knights have won five straight since acquiring Mark Stone from Ottawa at the NHL trade deadline. Fleury, who recorded back-to-back shutouts in his previous two starts, tied Jacques Plante for eighth on the NHL's all-time wins list with his 437th victory. The 15-year veteran netminder has allowed just one goal in his last 228 minutes, 43 seconds. Travis Hamonic scored Calgary's lone goal, while Rittich made 36 saves. Rittich, who dropped to 22-7-5, is 10-3-2 since Dec. 31.